Often times, and this is well documented, Vitalik and Justin Sun don’t mind having a go at each other. From comments about Justin Sun copy pasting parts of the Tron’s white paper to being a “deity-like” shill master not worth listening to, these influencers light up the space. And Vitalik, while busy coordinating security checks to ensure that the next major upgrade web 2.0 or Constantinople is bug free, responded to Sun’s claims that Ethereum rise to prominence was because of its role in late 2017 ICO mania. To some, this is an irrefutable fact–which we all agree and we have seen what happened to ETH prices when regulators got involved banning ICOs and cracking down on token market places. Although Vitalik disagrees with this statement, he didn’t counter Justin and instead, he went on to call him a “shill king” and TRX and Tron success depends on Justin’s ability to “throw <<TRX>> into a list of other coins that you know the recipients of their shilling already approve of and get them to associate your coin as “one of the pack”. Vitalik made this comment when a Cornell University Professor Emin Gün Sirer said Tron is not even close to a blockchain operating system as marketed by Sun. The more ETH prices consolidate at or around spot rates, the wider the XRP—ETH gap becomes. At current prices, the gap is $700 million but it could be worse if sellers fail to recoup Jan 20 losses and bulls fail to drive prices above $135 even with our upbeat price outlook. 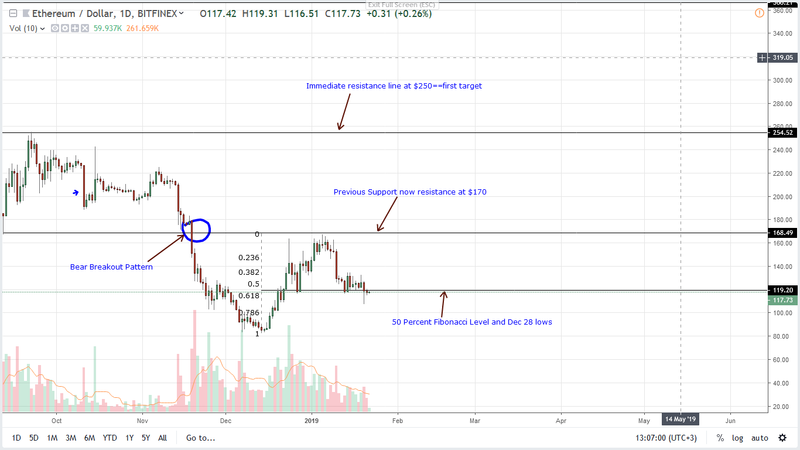 As mentioned before, we are net bullish on ETH and the rally to $170 largely depends on today’s price action. If bulls overcome headwinds and spring back above Jan 20, then buyers have a chance. If not, ETH could spiral towards $100 or lower by end of the week. Obviously, when we analyze price action of the past 12 months in higher time frames, then the trend is bearish. However, in the last few weeks, there is a clear ETH demand in lower time frames. Part of this demand was from Constantinople’s expectation and what it meant for scalability. But it never came through and now market participants are simply reacting. As such, prices appear to be breaking off, confirming the trend continuation phase of a classic bear breakout pattern set in motion by Nov 19 sellers. Unless otherwise there is a spring above $135 or Jan 14 highs, it’s likely that Jan 10 sell-off will continue. Back to our lenses is the level of market participation. Unfortunately for buyers, bear volumes are rising. Check out Jan 20—370k, compare them to averages at 180k and those of Jan 10—684k. They are still low but above recent averages and as they rise, today’s close will set the trend for the next few days. Ideally, we would like to see prices close above $120 as the main support line is confirmed.